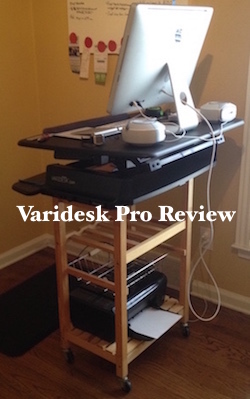 Once upon a time in 2015 I wrote this review for the Varidesk Pro standing desk. After a year of ownership I had to sell it due to home office arrangements changing. We had two babies a year apart from each other and our office was now a baby room. I bought a MacBook Pro and worked from the kitchen table for a while and still do. I bounce back and forth between the kitchen table and a quasi office I have set up in our unfinished basement. In 2017 I purchased a Realspace Magellan pneumatic standing desk and have my iMac, printer, etc. down there. I prefer that desk over the Varidesk. One, it’s a desk. And two its easy to maneuver. My guess is the entire desk is lighter than the Varidesk. Everything below this is still true about the Varidesk and if you’re curious about buying one then I hope this helps. What lead me to buy the Varidesk in the first place was after a bit of self diagnosing I concluded that years of sitting on my arse is a leading factor into these ailments. Knees and hips are not liking all the sitting. And I found a number of people saying the same thing and how they combat it with stand up desks. That’s what lead me to the Varidesk Pro. I had a very nice glass desk from Ikea and getting rid of it did not make sense at the time. I liked how the Varidesk sat on top of my old desk and could be moved anywhere. Figured my iMac would fit and look oh so pretty on it which it does. Can’t remember why I went with the Pro version instead of the Single version besides it being only $50 more for the Pro. I got super-sized. Flexible – Move it where ever your standing desires are needed. 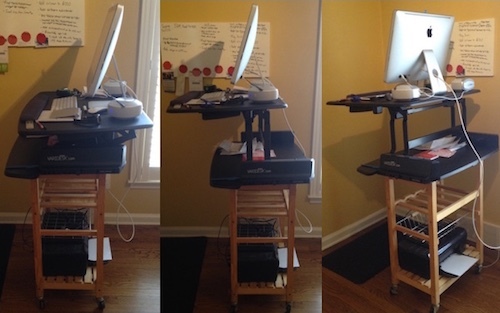 Sturdy – Put it down and the Varidesk ain’t moving. Well built – Nothing flimsy about this bad boy. Multiple settings – Works for people of all heights. 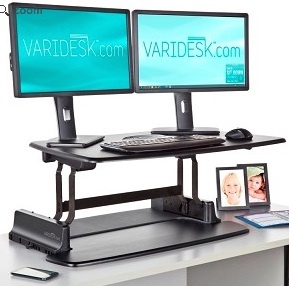 Varidesk app – Alerts you to stand up. Keeps track of calories burned. Lives up to expectations – The Varidesk performs exactly how it says it would. Heavy – Its 48 pounds. Thought it might break my glass desk but it didn’t. Expensive – At $350 plus $50 in shipping it can put a dent in your wallet. Large – 36 inches long by 23 inches wide. There is space for a notepad and you can store stuff between the upper and lower levels. The Varidesk Pro has done exactly what I thought it was going to do. I spend quite a bit more time standing up now when I’m working and notice a difference in how I feel at the end of the day. More energy, bloods pumping through the body, stuff is stretching. All good things. Saying all that I had to sell the Varidesk with my home office being eliminated due to babies. The amount of real work I will be doing at home will be done from our kitchen table and the Varidesk would look stupid sitting on it. I love my iMac but I foresee me switching to a MacBook so when I need to stand up I can slide over to the kitchen counter. If you go the standing desk route you must buy an anti-fatigue mat to stand on or your knees will hurt something fierce. I just checked the Varidesk Companies website for the first time since I bought mine and noticed they have come out with a few more models. Nothing that screams home office yet so maybe soon.